It's easy to feel hopeless in the face of statistics indicating that students with disabilities have fewer educational successes and greater quality-of-life issues than their classmates without disabilities. Yet every week I meet students, teachers, and families who transcend these statistics and are making exciting educational progress, From Disability to Possibility™. This book takes this concept a step further, from possibility to success! In From Disability to Possibility®, Patrick Schwarz made a passionate and compelling argument for the inclusive classroom. From Possibility to Success takes Patrick's case to the next level by providing teachers with powerful new tools to make inclusive education work, along with guidelines for incorporating them into classroom practice. With the goal of building lifelong skills, Patrick offers templates and authentic forms that help you plan lessons and units while at the same time embracing students' interests and passions, working toward students' dreams, promoting leadership, self-advocacy, self-determination, and membership in both school and the community. With an explicit overview of each tool, a rationale for using them, and compelling stories of how they have helped real students in real classrooms, Patrick empowers educators to combine the science and art of teaching all learners. Try them out and discover hope, direction, and inspiration to turn possibility into success. Three decades after landmark special education legislation promised a better learning experience for students, special education is still just that — a promise. In America we have earned a failing grade in educating diverse learners, as evidenced by their overwhelming underemployment or joblessness after graduation. We can do better by adopting a new model — one that honors varied teaching and learning styles, transforming disability into possibility. Only then can we finally fulfill the promise of special education. From Disability to Possibility® leads the way presenting the specific kinds of teaching, classroom practices, and support approaches that will make this new model of possibility a reality. Drawing on the stories of learners, both with and without disabilities, as well as families and teachers, Patrick Schwarz shows you not only why many current special education frameworks don’t work, but also how they damage children, often for life. 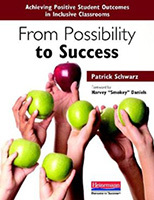 Patrcik Schwarz also demonstrates how possibility studies offer a meaningful, practical, and doable alternative to traditional special education practices both during the school years and after. Ideal for general educators, special educators, administrators, educational leaders, related service professionals, paraeducators and self-advocates, From Disability to Possibility® illustrates, through stories of struggle and success, how creative, conscientious teachers can work with everyone involved in a student’s learning to make special education work. In addition, Patrick Schwarz will show you that special education is a service, not a sentence, and that labels hurt. Patrick Schwarz’s ideas and passion will inspire you to look at diverse learners, their instruction, and their support in the classroom, the curriculum, and the social world of school from a new perspective: the possibility of disability. Three handbooks; 30 key ideas presented in small, smart packages; all the information necessary to start making inclusion work effectively. Whether you're a general educator, a special educator, an administrator, a therapist or a family team member, You’re Welcome presents the thinking you'll need to open your classrooms to all students. recommended print and Web resources. Get answers to frequently asked questions about crucial topics such as coteaching, team building, collaborating with students, integrating the IEP into the general education curriculum, creating personalized learning agendas and writing sensitive and responsive behavior plans. Read You’re Welcome and discover a powerful tool for implementing educational practices that provide meaningful help for students with a range of diverse abilities, needs, gifts, and struggles as they achieve effective educational gains. Just Give Him the Whale is packed from start to finish with unforgettable stories based on the authors’ experience, firsthand perspectives from people with Autism themselves, research-based recommendations, and sample forms teachers can adapt for use in their own classrooms. An enjoyable read with an eye-opening message, this book will have a long-lasting impact on teachers' understanding of Autism, and on their students’ social and academic success. One simple, beautiful book… endless new ideas! Pedro, a young boy with autism who loves whales more than anything, is heartbroken when he’s told to put away his favorite toy whale on the first day of school. But then Pedro’s teacher discovers the secret to helping him do his best work: not only giving him his whale, but also incorporating his special interest into the whole curriculum. 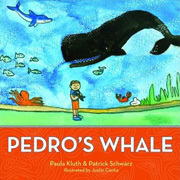 Soon, Pedro’s whale is helping all the children learn, as the teacher works whales into math lessons, storytime, and more! 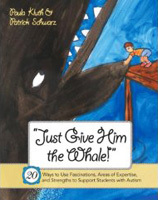 Based on the real-life event that inspired Paula Kluth and Patrick Schwarz’s bestselling Just Give Him the Whale! this simple but powerful story is a great teaching tool for educators and children alike. With Pedro’s eye opening lesson in mind, teachers and children will work together to create classrooms where students with and without special needs feel safe, motivated, and ready to learn. Spesso, chi si occupa dell’educazione di persone con disturbi dello spettro autistico tende a contenere fissazioni e stereotipie preferendo un tipo di intervento che limita invece di valorizzare gli interessi. Questo libro fornisce agli educatori di ogni ordine e grado un nuovo modo di pensare a queste «manie», affinché possano diventare strumenti di insegnamento positivi capaci di calmare, motivare e migliorare l’apprendimento. Paula Kluth e Patrick Schwarz, autorevoli esperti di autismo e relatori di fama internazionale, propongono una guida utile e adattabile a ogni situazione per utilizzare in senso funzionale gli interessi ristretti durante le lezioni in aula e nella quotidianità. Gli insegnanti scopriranno come sfruttare al meglio le passioni dei loro alunni con autismo inserendole nei programmi curricolari, per incrementare l’alfabetizzazione e le competenze matematiche, sviluppare relazioni sociali, accrescere le capacità di comunicazione, ridurre l’ansia e molto altro ancora. Il volume, corredato di storie basate sull’esperienza diretta degli autori, offre la possibilità di guardare l’autismo sotto una luce nuova per aiutare gli insegnanti che hanno a cuore il successo sociale e scolastico dei propri alunni. Una lettura piacevole che aiuterà ad aprire gli occhi e la mente, ponendo al centro del percorso di formazione l’unicità del discente.